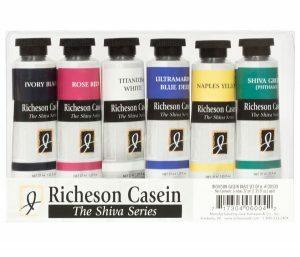 Manufactured by Jack Richeson & Co., Inc. in the United States, Richeson Casein is a series of 32 colours, available in 37ml tubes. 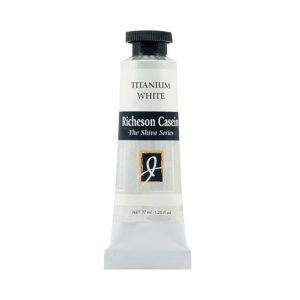 Titanium White is also available in a 150ml tube. 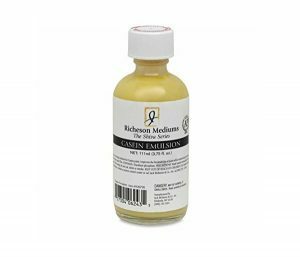 Casein Emulsion is available in a 110ml bottle. Casein is a quick-drying, aqueous medium using a milk-based binding agent, and is one of the most durable mediums known to man. Nine thousand year old casein cave paintings have been discovered in Asia. Later, the medium was used by Byzantine, Roman and Renaissance artists, including the Old Masters. 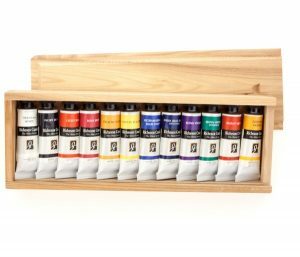 Known for their versatility and array of capabilities, casein paints can be used to create a variety of effects from the rich opaques of oil to thin watercolour washes. Because casein has an exceptional integrity of colour and always dries to a perfect matte finish, it is unexcelled for art reproduction. 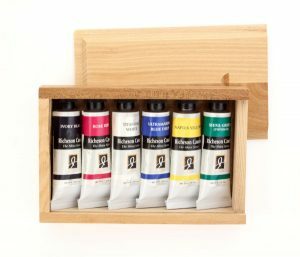 The velvety matte finish can also be buffed to a satin sheen or varnished to produce a resemblance to oils. Over time, casein pigments become resistant to moisture and the medium has a durability and permanence which has easily stood the test of time. Because it dries quickly, it is possible to lay down a glaze and move on to the next stage within a few hours, instead of waiting for days, or even months, as with oils.